Decorate your table with fun floral placemats. Leave a couple crayons, markers or colored pencils and your guests will decorate their own place setting! Now your guests can help decorate your table with these stylishly-designed paper placemats. 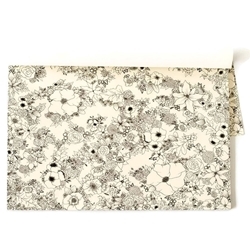 A sketched floral outline design adorns creme-colored kraft paper on these place mats. Place crayons, colored pencils or markers at each place setting and your guests can color between the links for a fun and memorable dinner activity.